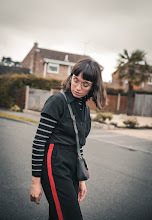 Just a quick post today sharing a new 'workout' outfit of mine which I've been wearing non-stop. I've been obsessed with these "denim effect" leggings from LIVE! ever since they first landing in my hands as they look so realistic-even down to the detail in the stitching, but feel so comfortable to move around in. In fact they are the perfect piece for when you're rushed for time when working out and don't get the chance to change your outfit. As you could easily get away with wearing these during the day with a relaxed basic tee and leather jacket. Definitely an ideal transitional work out piece for those of us who run busy lives.